This contribution was highlighted in a recent joint study from the United Nations Office for Outer Space Affairs (UNOOSA) and the European GNSS Agency (GSA), which showed that 40% of the 169 indicators underpinning the 17 SDGs are reliant on the use of space-based science and technology. Speaking at the event, GSA Executive Director Carlo des Dorides said that while the contribution of space services to communications, business and the economy is increasingly recognised, awareness of the benefits that space-based solutions can bring to the health, well-being and sustainability of the planet needs to be better understood. “As the only European Union agency operating and delivering space services, the GSA is dedicated to ensuring that EU investment in independent, civil run satellite navigation systems deliver real services and benefits for people and the planet,” des Dorides said. In his address, des Dorides noted that the synergy of Galileo and Copernicus supports the Zero Hunger, Climate Action and Better Life on Land goals through precision agriculture applications that optimise crop production. He also noted that the EU Space Programme directly contributes to the goal on Climate Action by supporting urban development and smart cities planning. “This is especially critical given that more than 60% of the global population will live in cities by 2030,” he said. UNOOSA Director Simonetta Di Pippo noted that, in order to bring the benefits of space to all nations, it is necessary to raise awareness of the importance of space science and technology to sustainable development and how it can contribute to the global community’s commitment to leave no one behind. 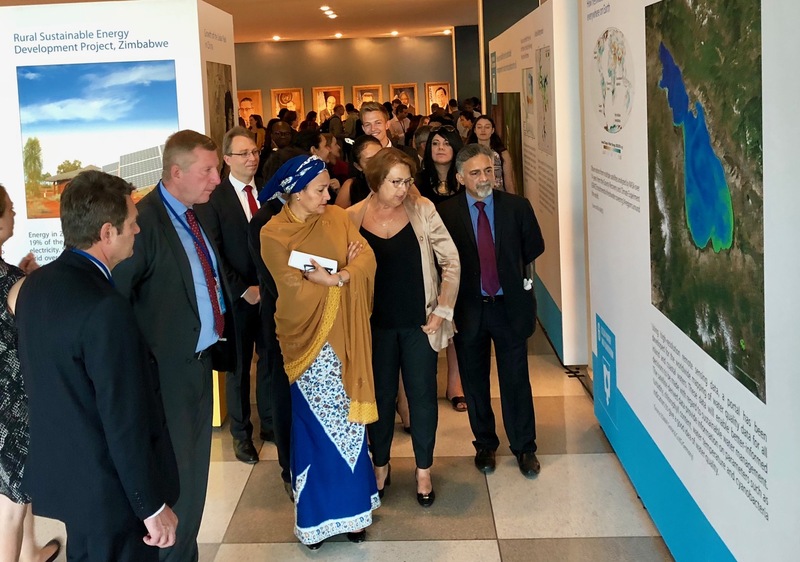 “Activities such as this exhibit offer us great avenues to communicate how space can contribute to the achievement of the SDGs and underline the need for all stakeholders and decision-makers to get involved,” she said. The exhibition, which focuses in particular on the SDGs being reviewed at a High-level Political Forum on Sustainable Development being held at UNHQ on 9-18 July, is organised by the NGO CANEUS International with the support of the UNOOSA, and sponsored by the European Commission, the GSA and the German Aerospace Centre (DLR). On the margins of the High-level Political Forum, the side event #SPACE4SDGS: The Space 2030 Agenda was held on July 10. The joint study from UNOOSA and the GSA - European Global Navigation Satellite System and Copernicus: Supporting the Sustainable Development Goals Building Blocks towards the 2030 Agenda – was presented at this event. The participants discussed the next steps towards establishing a coherent ‘Space2030 Agenda’ approach on how space science and technology is used to support the implementation of the UN’s sustainable development agenda. The side event also included a debrief on the results of UNISPACE+50, a global gathering of the space community held at the UN Offices in Vienna, Austria in June.